ART DESIGN INTERNATIONAL VOILA SIDE CHAIR LOW BACK | ADI | Alliance Interiors Inc. I love this chair! I have them in my office as guest seating and everyone that sits in this chair comments on the extreme comfort. 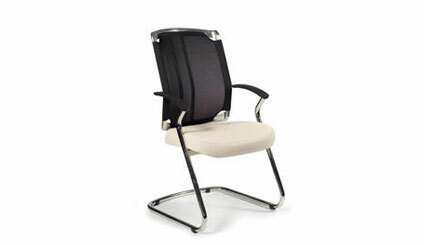 The chair’s cantilever base makes you feel like you are slightly rocking while allowing the mesh knit back to support the users back comfortably. The suspension seat allow the users body weight to distribute evenly making this a comfortable sit for long periods of time. I use these chairs as guest seating in executive offices, waiting rooms, enclaves, lobbies, and just about any area where a classy contemporary and comfortable chair is called for. You can also order replacement covers for the seat if you change décors. The ADI Voila Side Chair is approved by the Federal Government under the Master National Standing Offer (MNSO) for seating.